These Are the Days of Great Awakening! Although in Bible college all the single men thought this was the “bachelor’s verse,” yet it speaks of something more than just seven women and one man. There is coming a day when the Church will become so destitute of answers and agendas that she will turn to one Man, the Lord Jesus, and take hold of Him. We have taken hold of the world and we have taken hold of clever ideas, but the seven women (seven churches – see Revelation 2 and 3) are about to lay hold of their Beloved. The longing of the Church will be for Him. We will want to be called by His great Name. The splendor of His beauty will remove our disgrace and make us a worthy partner to labor with Him. There is coming a Magnificent Obsession which will grip our hearts. This obsession will be to lay hold of Christ and not ever let Him go! Like Mary did in the garden, thinking He was a gardener, until He spoke her name…then she wouldn’t let Him go! And like the Shulamite in the Song of Songs who, when she found her Beloved, held Him tight and wouldn’t let Him go! The unveiling of Christ within us is about to be the most explosive truth ever to hit the Church, bigger than any movement, conference, or teaching! It will fuel the flames of our passion to follow Christ and be all He longs for us to become. This glorious truth of His coming will capture us and compel us to lay hold of the One Man, Jesus Christ. It is not only the timing of His return that must consume us, but how He finds us when He returns. It is not if it is near or far, but rather if we are filled with faith, hope, and love. It is not the anti-Christ who is about to be revealed, but Jesus Christ! As world governments desperately try to cope with global economic, environmental, safety, and health issues, we have all felt its tremors, but please be encouraged: God’s Kingdom is still safe and secure! He will be our Magnificent Obsession as we move into the realm of kisses and thunderbolts! The LORD wants to come to His seeking Bride! He is doing this to remove our fear and our anxiety…for perfect love casts out fear. The love awakening is here! The Bridegroom is in the land! Trim your lamps of prayer and go outside the realm of familiarity and meet Him! LAY HOLD OF JESUS CHRIST, He is eternal life! First Timothy 6:12 says, “Lay hold on eternal life.” This means to take hold of, to grasp, to seize, to cling to! In the past we laid hold of ministry, a miracle, a mentor, now it’s only Jesus! LAY HOLD OF and EMBRACE HIS OVERSHADOWING presence, His glory… Just to be in His presence changes you and makes you a carrier, a dispenser of His glory. In the Book of Acts, they took note of the apostles because they had been with this amazing Jesus! I had a dream recently where I was told, “Don’t be proud Brian, Jesus makes anyone look good!” After the dream I felt fully qualified to be humble! LAY HOLD OF PERFECTION, maturity, and fullness! It must no longer be our works, or ministry, but His FULL glory pouring into us. To lay hold of Jesus is to become a mature vessel of honor that He can use. And by His faith, I will fully experience oneness with Jesus and the explosive power of His resurrection working in me. I will be one with Him in His sufferings and I will be one with Him in His death. Only then will I be able to experience complete oneness with Him in His resurrection from the realm of death. I admit that I haven’t yet acquired the absolute fullness that I’m pursuing, but I run with passion into His abundance so that I may reach the destiny which Jesus Christ has called me to fulfill! It’s TIME TO LAY HOLD OF JESUS for the last day’s GREAT AWAKENING! Cling on! 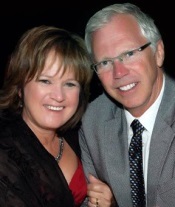 Brian and Candice Simmons have been described as true pioneers in ministry. As a spiritual father and mother, their teaching and spiritual gifts have opened doors in many nations to take the message of authentic awakening and revival to many. For the last 40 years they have labored together to present Christ in His fullness wherever God sends them. After a dramatic conversion to Christ in 1971, Brian answered the call of God to leave everything behind and become a missionary to the tribes. Taking his wife and three children to the jungle of Central America, they pioneered Church plants for many years with the Kuna people group. While serving as missionaries, they planted churches and established leadership for the new Believers. Brian serves as U.S. Director of H.I.M., which oversees nearly 20,000 churches worldwide. Known as dynamic and anointed speakers, they now travel the nations releasing this message of end time awakening. Brian is the author of numerous books that reveal depths of insight that the Holy Spirit has released for the last days. His best-selling book, The Journey of the Bride, has been translated into Korean and French. He is also is committed to finishing the translation of the entire Bible into a new dynamic-equivalent version called, The Passion Translation. Brian and Candice have been married for 42 years and have three children and six grandchildren and one great-granddaughter. Their passion is to be loving examples of a spiritual father and mother to this generation.